I’ve been continuously brewing kombucha for awhile and wanted to share my set up and method with you as it has been working well for me! 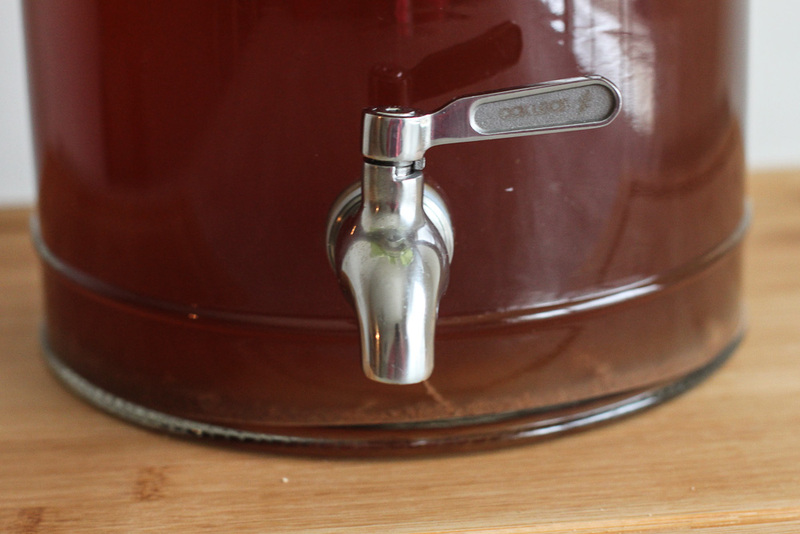 First, a quick introduction to the continuous brewing method of making kombucha at home. Continuous brewing kombucha is a method of making homemade kombucha and is supposedly how it was made in ancient times. 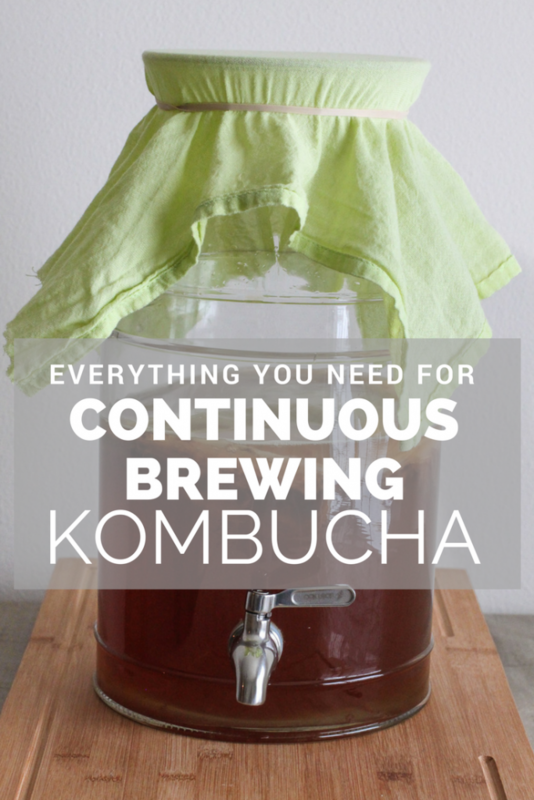 The continuous brewing method allows you to always have fresh kombucha available. It’s pretty simple: once you have established your brew you simply add the same amount in as you take out. It’s continuous! 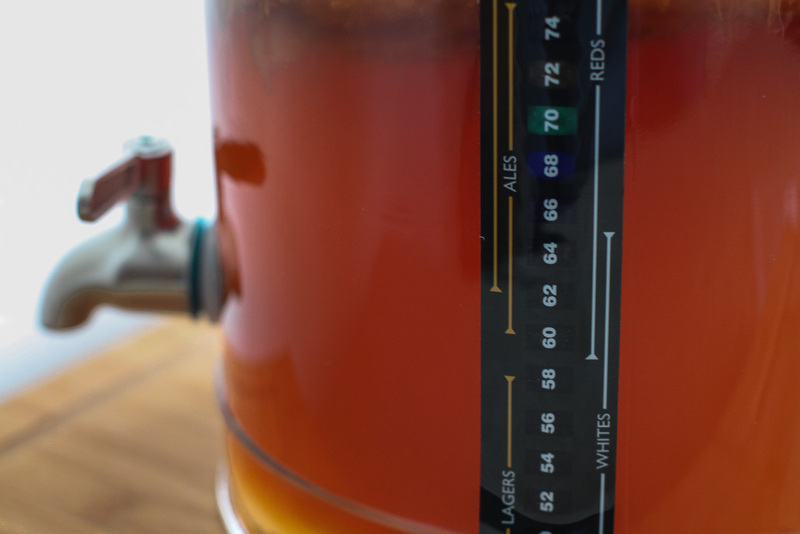 Continuous supply – Once you’re set up and operational, you’ll have fresh kombucha every 3-4 days. Low maintenance – Aside from a total clean out every few months, the only maintenance required is drawing off finished kombucha and refilling with sweet tea. Lessens your chance of contamination and mold – A continuous brew ecosystem has less of a chance of developing mold because you have a continuous supply of strong starter tea. This is a hostile environment for outside invaders. More beneficial bacteria and acids – A continuous brew offers you both younger and older kombucha in the same vessel. As I learned in The Art of Fermentation, the longer food is allowed to ferment, the more opportunity for bacteria and acids to form. Research has shown that specific acids in kombucha take 14-21 days to develop. If you wait 21 days for your batch kombucha to finish, you may be left with a vinegary tasting liquid. Continuous brewing mixes those older and younger liquids together giving you a pleasantly tasting beverage with potentially more beneficial bacteria and acids. This post contains affiliate links, thanks for supporting The Wild Gut. What do I need for continuous brew kombucha? While there will be some investment in your initial set up, it should pay for itself pretty quickly. You will need a vessel to brew your kombucha in. I use a glass drink dispenser that I found on clearance at Bed, Bath & Beyond. It holds 2.5 gallons which works for our family as we generally drink 1-2 16oz bottles per day. You don’t have to fill the container, so I would recommend at least a 2 gallon size as you can grow into it. You can use glass, porcelain or even stainless steel. Look for a product that is lead-free. My preference is glass because I am nosy and like to know what is going on inside my vessel. You will also need a tight-weave piece of cloth big enough to cover the top of jar. A piece of an old t-shirt or towel secured with a rubber band works great for this or you can even get these cute hand-made covers for your vessel. DO NOT use cheese cloth, the weave isn’t tight enough to keep fruit flies or other pesky bugs out. While black and green are the most commonly used teas, you can use any tea from the Camellia Sinensis plant. So oolong, white and pu-erh are also options. It’s also common to use a combination of teas. Avoid using teas with added oils, like Earl Grey, as the oils can cause stress to the SCOBY, eventually killing it. Herbal teas should also be avoided as they are not derived from the Camellia Sinensis plant and can not provide the SCOBY with nutrients that it needs. 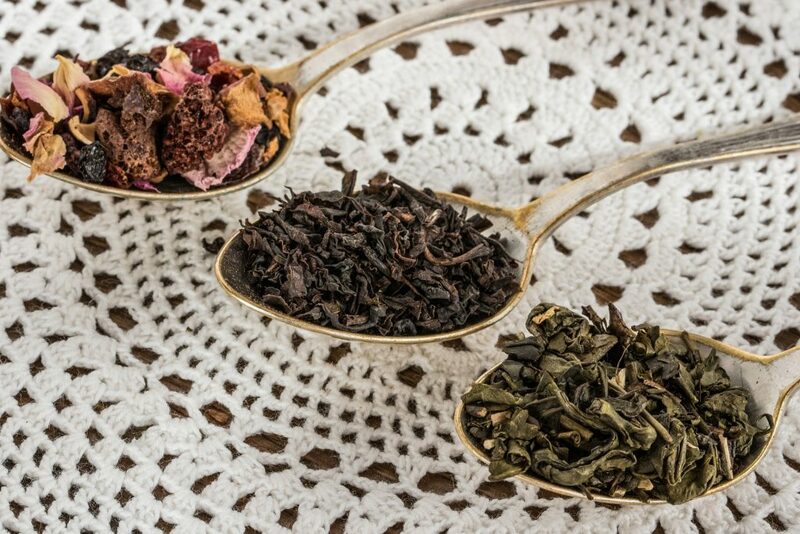 You can experiment with using a mixture of black and herbal tea but you’ll want to make sure the herbal tea does not have any added oils or artificial flavors, only dried herbs and fruit. Finally, I recommend using only organic tea. Awhile back I met a lady visiting from China and she said no one in her city would ever consider drinking tea that wasn’t organic. She has seen the pesticides used first hand and would NEVER consume it herself or serve to family or guests. She was very adamant about it and it left a lasting impact on me. Fortunately organic green and black teas are easily accessible here in the U.S. and are not significantly more expensive than non-organic. You can certainly make kombucha from non-organic tea but consider the pesticides you may be consuming. Organic white sugar or organic cane sugar are most commonly used. You can find them at most grocery stores including Aldi or Costco. There is also a big selection available on Amazon. Organic cane juice crystals are also a good option. Avoid brown, raw or whole cane sugar as these tend to be hard on the SCOBY and often produce a yeasty brew. 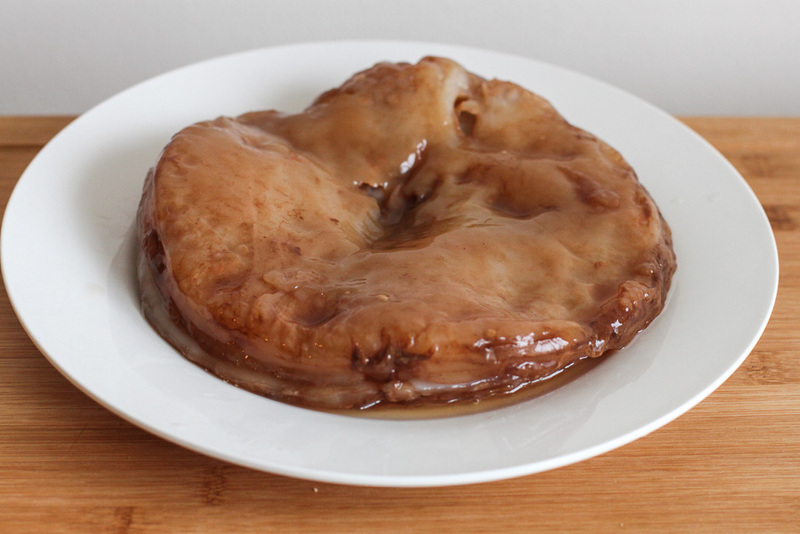 You’ll need a SCOBY to get started. If you can find a friend that brews, they should be able to give you a a baby SCOBY. You can also purchase one online. I can recommend this SCOBY seller on Amazon. They ship healthy SCOBYs with one cup of starter tea. You don’t have to worry about the size of the SCOBY. It will grow to the size of your container as you brew. You’ll need starter tea to get your first batch going. Starter tea is finished kombucha and is as important as a healthy SCOBY. For one gallon of kombucha, I recommend two cups of starter tea if possible, but you can get away with using as little as one cup. Plastic spigots can be ok. You want to make sure it is brew safe plastic and not coated with anything. The coatings will eventually leach out into your kombucha. Metal is a no as it can be harmful to your kombucha brew. 304 grade stainless steel is ok. I purchased a replacement stainless steel spigot from Amazon. It was super easy to switch out and it’s also easy to clean. Wood and cork are ok.
*At this point you are ready for continuous brewing! 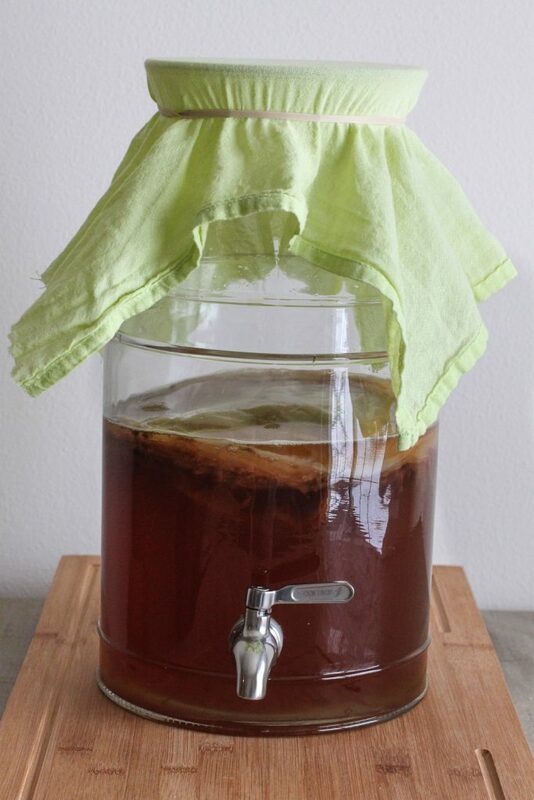 Oh yes, you can accessorize when it comes to home brewing kombucha! You can drink straight from the tap but many brewers prefer to bottle their brew. Bottling will allow your kombucha to build carbonation for a fizzier drink and it’s the perfect time to flavor your kombucha. It’s also the best way to store your kombucha for later consumption. It’s important to use bottles that are designed to hold carbonation. Grolsch beer bottles are great if you can get your hands on them. Otherwise, you can purchase swing top bottles. Do not use decorative or square bottles even if they have the swing top caps. These are generally not designed to hold carbonation and may explode. I have tried a few different styles and have developed a preference for these bottles from Otis Classic. 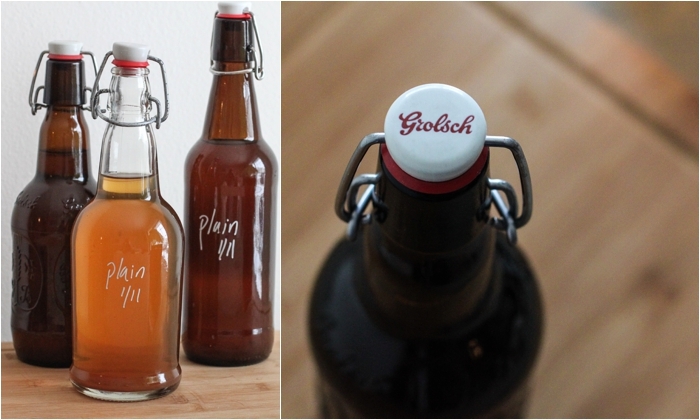 I like the clear bottles but the amber-colored ones will work just as well. A fermometer monitors the temperature of your brew. It sticks on the outside of your vessel so there is no mess. I recently purchased one and tested it. It actually works! I’ve been afraid that my brew has been too cold this winter so I have added this to my setup. I can monitor the temperature to be sure it’s warm enough. If you live in a colder climate, it can be difficult to keep your kombucha within the recommended temperature range of 68-78 degrees F. A heating strip allows you to increase the temperature by 5-20 degrees F. Though this gadget is a bit of an investment, it’s worth it for ease of brewing year-round. Alternatively, you can try a seedling mat. You can also try wrapping a set christmas lights loosely around your vessel. Of course, you need to be mindful and never leave them plugged in when you aren’t home. Which, in my opinion, defeats the purpose because your temperature will drop back down again once the lights are unplugged. It’s important to label your kombucha so you can keep track of what is what! I label my bottles with the flavor (if any) and the date it was bottled. I know my kombucha generally takes at least five days to carbonate to my liking. I started off by using masking tape and marker but quickly switched to this chalk marker. Have you brewed kombucha at home? Any other tips for those just starting out with the continuous brewing method? Great post! Do you have a second one on flavoring and second fermentation with the continuous brewing? We’re particularly interested in a Gingerade style KT like the GT’s brand. Hello! Thank you! I have a few different flavor ideas. And here is the ginger kombucha recipe. Enjoy! When you bottle up the kombucha does it need to be room temp to let the carbonation build up? Hi Elle- I do recommend leaving at room temperature to build up carbonation. You will still get carbonation if you put directly into the refrigerator but it will take much longer (like month or so). When continuous brewing you said “Then draw off 25% of the brew and replace with the same amount of sweet tea”, How do you make the sweet tea to replace the brew? Hi Kathy! Since I have a 2 gallon continuous brew vessel, I draw off 64 ounces (or a half-gallon). To replace with sweet tea, I boil 8 cups of water and steep four tea bags. After 10 minutes, I remove the tea bags and stir in 1/2 cup sugar, Once it’s cool, this is the sweet tea I use to refill my continuous brew. Here is a link to the ratios that I use in case you vessel is a different size. Let me know if you have any other questions! I want to be clear…for a 2 gallon container, I knew I needed to add 8 cups back in to replace. However, 4 bags of tea and 1/2 cup tea is half of the initial brew. We make our replacement tea weaker? Never mind. I thought through my own question and figured it out! Thanks for sharing your info! I’ve been looking at Stainless Steel Spigots (say that ten times fast!!) and they all have plastic O-rings. Did you use the plastic O-rings, or did it seal without?? Or use something different? Can’t wait to try all your recipes! Hi TT – Haha stainlessteelspigotsstainlessteelspigots! I did end up using a plastic o-ring. I am told the version I use is food grade plastic but as you are probably thinking… plastic is still plastic. I am currently looking for a wood spigot option to explore. Let me know what you decide to use! Thanks! Well I’m using the plastic one for now… would love a pic if your wooden one! Appreciate your sharing. Concerned when I add replacement tea do I remove Scoby or pour cooled tea on top? Hi Holli- I just pour my cooled sweet tea right over top. The SCOBY make sink and shift around but nothing to worry about. Hi Alana, thanks this is working well for me.. I have been drawing off 25% of about 1 gallon.. but I have a bigger vessel and would like to increase the amount.. DonI just add double or triple the replacement tea and add and allow to brew for a few more days than 3-4? Hi Sharee, glad to hear your continuous brew is working well! Yes, that should work just fine and is exactly what I did when I increased my vessel size. You’ll probably have to do a little taste testing to figure out when it’s ready to start drawing off the 25%. Just stir everything up, draw a little off to taste and if it’s still to sweet, let it go longer. Then you’ll be ready to start drawing your 25% off every 4ish days. Let me know if you have any other questions and please report back on how it goes! Hi, my partner and I just recently got our kombucha setup going, but we were wondering what you mean by a total clean out every few months. Does this mean completely starting over the brew every few months or just taking out the liquid and SCOBY while cleaning the vessel or something else entirely. Thank you for your advice! Hi Adam! That’s a good question. When I clean mine out I start over completely, but that is because I don’t have anywhere to store the liquid while I clean it out. You could definitely set it aside, clean, refill, and pick up where you left off. Something to take note of: You may notice that your brew gets a build up of “yeasty beasties” every few months. That is the sediment that you see on the bottom on your container. Sometimes a build up of yeasty beasties can make your kombucha turn “vinegary” more quickly. However, if the sediment doesn’t bother you and you are happy with the taste of your brew, then there is no reason to start over completely. Let me know if you have any other questions. I also love hearing about great flavor ideas that fellow home brewers come up with! I have a kombucha brewing now. This will be my first try, and a friend gave me my scoby for the starter with 1 cup of her brew. This is 7 days of brewing and want to let an expert look at it.may I send a photo to you to get advice? I hear so much about mold and it looks a bit questionable to the untrained eyes here. Hi Shirley- Sent you an email! Hi there! Love your post and am brand new to brewing! I have most of the items to start but have a few questions. 1.) Do I put the vessel in the fridge after it is done fermenting? And then ask I draw and add it just stays in the fridge correct? 2.) Once it is done fermenting and I decide to bottle it and let it carbonate…it does not have to be in the fridge…is this because it is sealed? After waiting for it to carbonate (I think you said 7 days) would I put it in the fridge at that point? Thank you so much for all of your help and your lovely posts! Hi Sara! Welcome to the world of brewing kombucha! Once you are comfortable with the process, you’ll love how easy it is. 1. I would not recommend putting your brewing vessel in the fridge. The colder temperature can actually weaken your SCOBY, putting your brew at risk for mold. When you are done brewing, you can let your SCOBY sit in the vessel at room temperature, just be sure to leave enough tea to cover the SCOBY as you don’t want it to dry out. You can put the finished kombucha in the fridge and enjoy. You can also drink straight from the tap if you don’t mind your kombucha being room temperature. 2. Once you bottle your kombucha, leaving it at room temperature will allow carbonation to build as it is still fermenting inside the bottle. Moving it to the refrigerator will slow the fermentation process way down and also slow any carbonation building. I always recommend burping bottles (once a day) that are left at room temperature. Once you get more comfortable with how fast your kombucha carbonates, the burping may not be necessary (or at least not as often). Burping the bottles helps to ensure your bottles never explode. It’s also a good idea to store the bottles in a box or plastic bin. Not only will this contain the mess should you ever have an explosion, it will also ensure no one gets hurt! I’ve never had a bottle explode, but I have seen plenty of photos of kombucha and glass in every corner of the kitchen (including the ceiling)! Just a question, the 14 cups of spring water, when does that go in? Also my friend gave me a scoby but only about 1/2 cup of starter tea! Will this still work? Hi Lisa, the 14 cups of spring water is used to make the tea. Yes, you can use 1/2 cup starter tea but I would aim for a smaller first batch (1 gallon or less). This is my first try brewing kombucha . Made my own scoby, and am using your continuous method brewing information. Thanks for the AWESOME post and all the tips. Can’t wait to see how it turns out! I have read through comments and I think I know the answer to this question…. but I want to make sure. When I stir the kombucha before drawing it off, will that not break my SCOBY? If so, does it matter? Thank you for all of your help! Hi Andrea, nope no worries about breaking it. Let me know how your first batch turns out! Hi Andrea – You can go ahead and refill straight from the fridge. A lot of people make up a big batch of sweet tea and use it to refill for a couple weeks. Just be sure it can’t get contaminated in the fridge. Enjoy! Thank you! Just read in your bio that your love of fermentation started in Guatemala. I just visited Guatemala in august and and took a day trip to Lake Atitlan. . . I love that that’s where it all started for you. Five weeks of yoga and healthy eating at Atitlan sounds AMAZING! Just started my continuous brew. When you get ready to draw off the kombucha, and you say to “ stir it up”, do you take the Scoby out before stirring? Hi Susan, you can actually leave your SCOBY in while you stir. One less step! I did not think and brewed tea with unfiltered, regular tap water. For some reason I used filtered water to add. Did I likely kill this SCOBY and batch of kombucha? Hi Leah- No worries! Everything should turn out just fine. It can become a problem if you use tap water over and over because your SCOBY, kombucha, and subsequent stater tea will weaken over time. If you have time, please report back and let me know how your batch turned out. The water that comes out of the tap, do you have a well, if you’re on a municipal water supply wouldn’t that have fluoride and chlorine or some kind of “purifying” agent. I guess this post was so long ago it wouldn’t matter to that person anyway, though I was curious if you assumed her tap was city water or if that’s not important either? Hi Dawn-I was assuming she was using tap water from a municipal water supply. The fluoride and chlorine will inhibit the brewing process because it is, in a sense, counteracting with what the kombucha is trying to do (ferment thus increasing bacteria in the liquid). Hope that helps. Feel free to reach out with any other questions! Hi Mason – Good question. In our opinion you can use rooibos for flavor, but we recommend using it only for batch brewing or during a secondary ferment for added flavor. Some flavored tea or additives may contain anti-microbial properties, which can harm the SCOBY, so we don’t suggest plugging that into a continuous brew process. During the fermentation process the SCOBY needs certain nitrates and sugars to feed on and the rooibos may not have the necessary capacity to provide everything needed for maximum fermentation. Play around with it in batch brewing initially and see how it tastes or turns out, but more than anything I would suggest using it in a second ferment. Thanks! Hi Isaac, great question. The best way is to scoop out some of the kombucha (I use a measuring cup or soup laddle) and taste. If your brew tastes fairly sweet, you most likely want to leave it go a few more days and then taste again. Everyone prefers a different sweetness to your kombucha, with some experience, you will identify your preference. We bottle ours when there is just a hint of sweetness. Can I use my used Kevita kombucha bottles for second brew? Yes, you can use the Kevita bottles for a 2F. However, be aware that the lids may start to wear quickly and you probably won’t get as much carbonation verses a swing top style bottle. The swing top bottle keeps a tighter cap on the bottle for your 2F, but the fermentation process will still continue with using a Kevita bottle and cap. Thanks! I know this is an older post but most understandable to me. Thank you. My question is once you get going what if you travel and leave for a four day weekend from time to time? Or what if you go for a week? Do you have to start over or can you let it get a bit too vinegary and then just disguard some instead of drinking it when you get back? How would you get it back on track? Thanks again. Hi Mardie, great question. You can just let it go a little longer. If it is too vinegary for your liking, try using it in a homemade salad dressing! Just replace with sweet tea as you always would. If you let it get too vinegary several times, you might be in a place where you want to start back over as you may not be able to kick that vinegar taste. Letting it go longer 2-3 times shouldn’t be anything to worry about. Can you use decaf black tea? I can sleep if I drink much caffeine? If not what would you suggest? What about Hibiscus tea. Yes, you can. However, I would recommend staying away from any herbal teas. I am a wine maker and have a good background in fermenting wine and beer. My question is, does the SCOBY have to be in an open air/container environment or can it ferment in a closed, but vented air lock type of container. Usually there is enough air/oxgygen in the wine mixture to ferment and the wine is stirred every couple of days to reintroduce oxygen back into the liquid. It seems that the relatively low Sugar/low alcohol producing effect would not warrant any extra oxygen or continuious need for oxygen in the brew. Also can yeast fertilizer, Like DAP in wine making, be used to help with SCOBY health and Longivity? Thank you for this post. I have a couple of questions before I begin my first continuous brew! 1. Is the point of the spigot to make it easier to draw some of the liquid? My mother in law is the one who got me into Kombucha and she has always just used a big jar. 2. 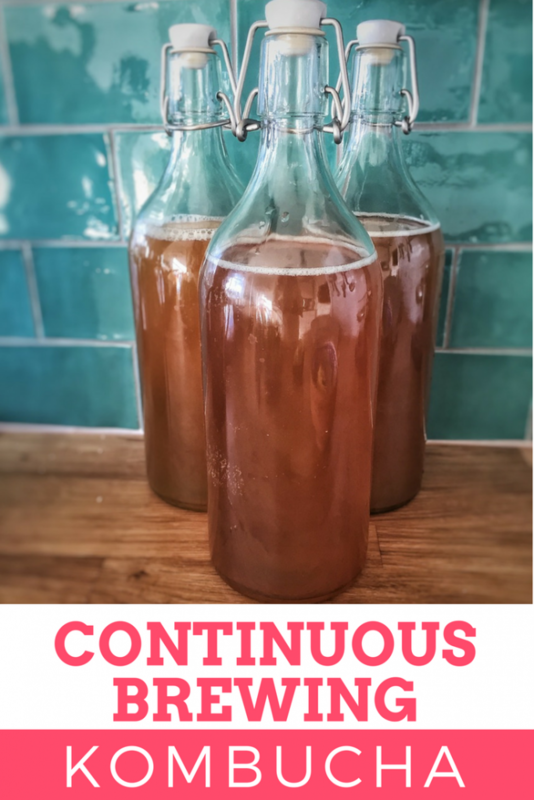 Does the “continuous” approach eliminate the need for a scoby hotel? Is the scoby hotel just for individual brews because with continuous approach you just keep adding to and reusing the same scoby? 1. The spigot makes it easier to draw the kombucha. It sounds like your MIL is using the batch brew method. Batch brewing is an excellent choice too (we do both). 2. You will still need a SCOBY hotel or friends who want SCOBYs. You don’t have to remove a SCOBY every time you add new sweet tea but you will have to think them out every so often. You don’t want your SCOBYs to get too thick. We probably thin them out every 6 weeks or so. Hope this helps, feel free to reach out when any other questions. Happy brewing! Hi! My continuous brew became carbonated. I’m a beginner and have only bottled twice so far. Is it ok that the continuous brew is carbonated? If not… how do I get it back to normal? The carbonation is lift my SCOBY up a little bit. My SCOBY is pretty intense too. Hi Emily, that happens with ours sometimes too. It is due to the SCOBY creating the quite the seal in your vessel. 🙂 It’s nothing to be alarmed about but if you want to just give your brew stir, that should release the carbonation out of the top. Sounds like you have a healthy continuous brew, yay! If I understand right, you have to brew tea every 4 days for continues brew, instead of every 10-14 days for regular brew? What is the advantage? The advantage is you have a continuous supply of fresh kombucha. It’s great when you have multiple kombucha drinkers in the house. Newbie here. Many of the tutorials I have watched have said to keep the kombucha in a dark area or covered up, yet yours is in a glass container. Where do you keep yours? Did you ever find a wooden spigot?